Welcome to CSN.1 and ASN.1 Message Analyser for 2G/GSM, 3G/UMTS, 4G/LTE standards. This WEB page provides online functionality to decode and encode the protocol stack messages between mobile station and network defined by 3GPP standard. 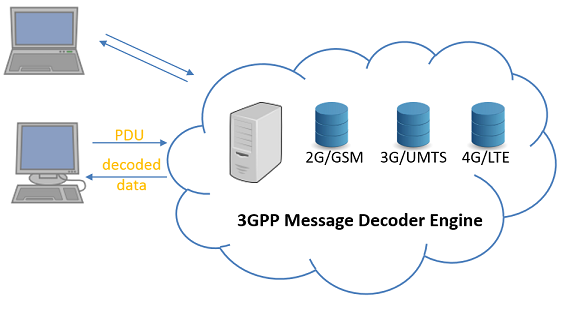 The decoder is a WEB based application for decoding and encoding protocol stack (2G / 3G / LTE) messages defined by 3GPP standard and encoded using ASN.1 algorithm. Showing Hex and Binary representation of the message elements. For comfort of developers the decoder shows all parts of the message in Hex and Binary forms. Not only decoding of message PDU is possible, but also composing & editing. You can choose version of 3GPP to be used for decoding. up to date with the latest 3GPP specifications. A new Web Service is availabe now for automated decoding of the 3GPP air interface messages. It supports the CSN.1 and ASN.1 messages from 2G/GSM, 3G/UMTS, 4G/LTE defined by 3GPP standard (see full list of supported messages). It is a really nice tool! Support of "Rel13 V13.2.0" for E-UTRAN RRC "TS36.331"